Ester oil with no dye. 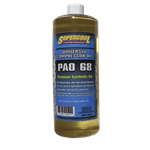 Pag Blue Universal Pag OIl 8oz. Copyright © 1999-2008 AC Source, LLC - "Your Source For Automotive Air Conditioning Tools, Parts, Equipment, and Kits"